Which is More Stronger : Destiny (भाग्य) or Action (कर्म )? Destiny vs Action is the eternal debate in society just like the hen & egg debate . An astrologer is always confronted with this question , so I am also no exception and 40% of my time is spent in giving a convincing answer for this. So, today I am giving my view on this question. Since I am also an experienced engineer , I would give only practical answers. Everybody would agree that any action has to happen against a background , whether you click a photograph , sow a crop , construct a building, earn money and so on . There absolutely can not be any action without a backdrop . This background is destiny . So, your gender , body features, personality, IQ , family you were born in, education , finances at your disposal, relations, your city / village , state , nation, continent , caste , religion , language etc form background for any action you are going to do. All the backgrounds stated above are default when you are born and mostly you have no control over them . Now background like a field is itself inactive so despite best background, zero action will create zero desired-result.For example , somebody sends you sweets , but 10% action of eating has to be done and if not done , sweet’s existence will be meaningless for you. Therefore, we can conclude that Action & ( Acted upon ) Background complement each other like nut & bolt duality and their singular existence is meaningless and irrelevant. I would describe it through the age old story of a thirsty crow . 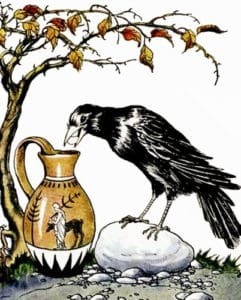 A thirsty crow searches water to drink and he finds a pitcher with some water inside but not at the brim , so crow acts and picks some pebbles and drops inside pitcher , water level rises and crow quenches his thirst. Each one of us goes through this story every day while making decisions. On the surface , the story emphasizes the action part for getting a result. But if you go deeper , you find that it is equally important to know, what was the water level inside pitcher , were the suitable pebbles available nearby and what time and strength the crow was having to undertake this project in thirsty condition . All this information forms the background whether the action is to be done to get the desired result or to be abandoned . 1. Water level was 90% and suitable pebbles were available near pitcher itself and Crow had enough stamina and time . This is luckiest scenario as it has best background , so only 10% action will lead to desired result. But only 15% people may have such good luck as per normal distribution Bell curve . These people do not need any astrological advice. 2. Water level was 50% and suitable pebbles were available at approachable distance and crow had just adequate stamina and time to fill the pitcher with pebbles by doing 50% action. This is average luck scenario and about 70% people fall in this category. These people should be advised by astrologer for better and efficient actions to reduce the Action part. 3. Water level was 30% , suitable pebbles were at long distance and crow did not have enough stamina & time to do 70% action. This is unluckiest scenario and this is applicable to 15% population as per Bell shaped curve and here astrologer should advise abandoning the current project / change of strategy or going for a new project. There can be many more situations. For example , if water is below 30 % , any amount of pebbles will not bring it to the brim as you need a minimum level of water for bringing it to brim . The beck of crow limits the size of pebbles, crow’s body has a limited stamina and so on and searching for a more filled up pitcher may be a better option. Therefore , even if action may not have any limitation , the background will always impose limitations on every action and we should be aware of this before action. Thus, theoretically all results may appear to be achievable but practically they will have limitations imposed by background. In such cases , your action part will naturally increase and that may make the desired result unimpressive. For example , wireless power transmission has only 5% efficiency , so nobody will opt for that while being technically feasible. Solar power technology has been available since 50 years but only now it has become commercially viable as people are now accustomed to electricity needs. The techno-economic feasibility study in technical projects is done only for knowing this and projects not viable are rejected. One can grow any crop inside a glass house but exorbitant cost of such crop will make it market and user unfriendly. That is why in all human endeavour , there is considerable emphasis on studying the background factors whether it is recruitment for employment , admission in academic institutions , soil investigation for building construction , soil quality assessment for growing crops , starting a factory or industry , market demand surveys for trading or launching any new product to arrive at a cost-benefit analysis for attaining a profitable venture. Cosmic Background is the Ultimate Limitation ! In the beginning of this essay , I narrated many types of background which limit a person’s potential results. Our Earth is part of solar family and it is sandwitched among its co-planets. These planets and Moon and Sun control every moment of life on our Earth , not for humans only but for everyone on this planet. Earth’s rotation creates our day and night, it tilt on axis creates seasons, its revolution makes a year and Moon creates ebb and tides in oceans. This way , the planets do affect us in every aspect , whether we accept this fact or not , just as gravitation force acts whether we know Newton’s law of gravitation or not. There was no financial or personal reason or incentive for ancient astronomers who got interested in knowing and studying this cosmic background and co-relate its effects on Earth affairs like famine, war , flood etc and on individuals also. The data collection for hundreds of years led to some concrete statistics that cosmic background does play a limitation on Earth and human affairs and that collective study was known later on as Astrology. This science is the oldest of all sciences and is like grand parent of modern science. Our grand parents may have less current affairs or technical gadgets knowledge but they have more experiential wisdom than young generation. Similarly astrology may not have instantaneous appeal of modern science but it has centuries of human wisdom for happiness , contentment , work-life balance . The science we swear today is more like young generation wanting to achieve success by any fair or unfair means without understanding the fall out to society and nature, whereas astrology is more mature like grand parents . How Bhaagya & Karma are Inter-Related ? Coming back to our main topic of action and background, these both are also inter-related and inseparable. The correct example for this would be TIME. Time consists of Past and Future and its junction line is called Present . Now past is before and future is after. The background is always earlier and action is later and once action is over on background, the net result adds to old background and a new background is formed for fresh action . In bank account , previous balance is your background for deposit / withdrawal and after deposit / withdrawal , the new balance is your new background. This way at every moment of decision-making, destiny works like a background for any action but post-result of action, a new background (destiny) is formed for further action . This way , your birth chart destiny is for birthday only and one has to add or subtract the resultant actions till date, to find current destiny . This way destiny can be changed in small steps but not instantly. This very well happens in company’s annual result sheets , where current net profit becomes capital for next year. Similarly, initial authorised capital , current subscribed capital , previous loss / surplus etc form the background and based on all those factors current market rate of company equity is decided . This is a dynamic process and action result keeps on merging all the time to form a new background. This way , we see that birth chart only gives the initial face value of equity share and subsequent actions , dasha , transits and their action result add or subtract to this face value of destiny share and form the basis of current market rate ( current destiny) of shares, on which company can base its further action ( financing) . So, next time when you see someone hotly debating or emphasising (Action)Karma over Bhagya ( Luck), you will be knowing that it is worthless debate , as you cannot say that value of a coin depends only on head or tail . The right answer is both are equally important and together they make a coin. So destiny check is important to optimise the actions to get desired results and astrology was invented as destiny check tool and not for avoiding the Action part .